The last time Nathan Peterman played the Los Angeles Chargers, he produced one of the most infamous first-half performances of all time. The Buffalo Bills aren’t going to let history repeat itself in Week 2. Head coach Sean McDermott named Josh Allen the starting quarterback moving forward, and he too will make his first career start against the Chargers. Allen took the field in the third quarter last week when his team was down 40-0 to the Baltimore Ravens. He played exactly half of the Bills’ 64 offensive snaps and ended up as the team’s highest-graded player at 73.3 overall, finishing with 74 yards on 15 attempts. Two of his incomplete passes were the result of drops, and two were thrown away. On a small sample size, the rookie quarterback had the second-highest percentage of his pass attempts dropped (13.3 percent). It also gave him an adjusted completion percentage of 61.5 percent that ranked 29th out of 34 quarterbacks, just ahead of the likes of Matt Ryan, Deshaun Watson and Jimmy Garoppolo in Week 1. In the preseason, Allen showed a penchant for extending plays with his legs. His average time to throw was 3.2 seconds, the fifth-longest of any quarterback. Both of his exhibition touchdowns came on passes that took longer than 2.6 seconds to throw, although, like most quarterbacks, his completion percentage was higher on quicker passes. 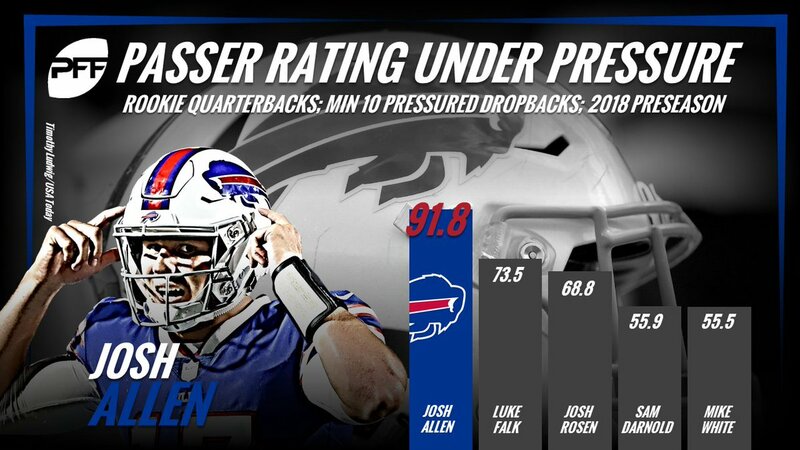 The Bills are hoping he provides an upgrade over Peterman, who finished as the lowest-graded player at any position in Week 1, with a 24.3 overall mark. Keep an eye on how often Buffalo runs play action moving forward. In the first two and a half quarters, Peterman showed the play fake on seven of his 22 drop backs (31.8 percent), while Allen was the only quarterback in the NFL who didn’t run play action in Week 1. The seventh-overall pick will make his first career start against a Chargers defense that allowed 256 yards and four touchdowns to Patrick Mahomes last week.